The number 1 rule when it comes to packing: ALWAYS BRING MORE THAN YOU THINK YOU NEED! Traveling is stressful enough. I don’t like to add more stress by worrying whether or not I have enough supplies. You might feel like a crazy person for packing so much but I always like to be better safe than sorry! My rule of thumb is to gather how much supplies + backup supplies I would normally carry on an everyday basis then DOUBLE it. MedAngel: I have a full blog post on this amazing temperature sensor. It is a small sensor that it specifically meant to protect medications (including insulin) from reaching unsafe temps. It connects to your phone via Bluetooth and sends alerts when medication is reaching unsafe temps! More in depth details can be found HERE along with a coupon! 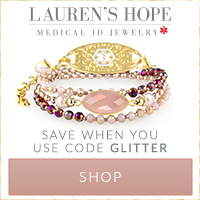 Medical ID Jewelry: I’m guilty of not always wearing a medical ID but I feel that it is extremely important to wear one when traveling. Traveling pushes you into situations where you are surrounded by strangers. In case of emergency, you will most likely be surrounded by people who have no idea who you are or how to help. I 100% always wear a medical ID when traveling! I have a fancy one that I wear throughout the day and a silicone one I wear in the pool. I have a video all about medical ID’s, coupons and my favorites H​ERE! I think TSA makes anyone nervous! The agent you first encounter rarely ever smiles. Then you get pushed into a line where everyone is scrambling to take their shoes, pull their laptop out, get their liquids situated, get everything out of pockets. Next thing you know you are barefoot in line waiting to go through a scanner, x-ray or pat down. Here is where the American Disability Act comes in to protect those living with Type 1. You can opt out of any x-ray or body scanner and request a pat down instead. Most insulin pump and CGM companies recommend that you do NOT go through x-ray machines or body scanners. (I am guilty of just going through the scanners on occasions where I am short on time. Nothing has ever happened to my pump but manufacturers still don’t recommend this.) You can ask to go through a regular metal detector but usually your device will set it off anyway. What’s the difference between these machines? Full Body Scanner: This is the most popular method airports use to screen passengers. You step into a pod-like machine where you are asked to put your hands up. It scans you front/back/top/bottom. X-ray: This is used to scan your carry-on items. It is a conveyer belt used to scan anything you are carrying with you. Example: carry-on luggage, purse, laptop, shoes. Metal Detector: This is sometimes used when the line for the body scanner is too long and TSA wants to get passengers through quicker. It is also used when a passenger is in a wheelchair or if a passenger opts out of the scan. Personally, I just opt out of the body scan and metal detector and ask for a pat down. Please note that they cannot force you to walk through the machines, but they might try to persuade you. Please do what feels right to you. Usually you will be asked to rub your pump/CGM and then they will swab your hands for “explosives.” There have been a few times where something was detected on me and an alarm came up saying “EXLOSIVES DETECTED!” I’m not sure what caused it but that’s when my pat down turned from slightly uncomfortable to extremely intense! It took quite some time to go through the procedures. Getting through TSA has never ever been the same procedure twice. Each time has been different even when going through the same airport. Just prepare for the unexpected and plan for extra time. Insulin: It is always allowed in your carry-on bag. NEVER CHECK IN INSULIN. Temperatures can vary in the cargo area and cause insulin to spoil. Glucagon: It is original packaging with a label. Juices and Quick Sugars: Most airports in the US allow you to carry these items through security even if they exceed the 3oz restriction. (strictly to treat hypoglycemia) It is not always guaranteed so I recommend bringing another form of sugar. All needles, syringes, and any other supplies you may need can go through security. There is no need to disclose that you are carrying them. If TSA does a manual search of your bag they will ask “Is there anything sharp in here?” You can explain then that you have syringes. If you feel like you still need additional help getting through security, you can call the TSA Cares hotline before your trip. This is a FREE service provided to passengers who need additional assistance. I know many parents of Type 1 children who use this service when traveling. Click HERE to learn more. Another service available to ALL travelers is called TSA Pre Check. Please note this is different than Pre-Boarding. Pre Check is a PAID service available to anyone who applies and gets approved. It helps expedite security screenings. ***I have not used either of these services listed above but I wanted to share for your info. Let me start by saying that the option of pre-boarding is granted to ANYONE who states they have a disability (visible or not) and want to pre-board. You don’t need to prove how “disabled” you are to get on board. Now let me address the word “disability.” I personally do not feel like I am disabled BUT diabetes is by law classified as a disability. That’s why we are granted protection and rights in very many different situations. To learn more about your rights click HERE. So now on to why I personally pre-board. Please remember that this blog is all about my glittery, girly, fabulous life and I just happen to live with diabetes. I have never claimed to be a diabetes expert or a perfect diabetic. I just share how I personally live my life, what products I like and what works for me. I find it comforting when others share their own experiences and you can give or take what works for you! WITH THAT SAID, I pre-board about 90% of the time. It helps give me peace of mind that I will not be waiting in a long line to board and risk my BG dropping. I can get seated and have guaranteed room for my carry-on. I don’t want to risk having my supplies far away from me. Also, I suffer from neuropathy and circulation problems, so I like to have room for my feet. I have less stress and anxiety when I pre-board which also helps my BG stability. The list goes on and on but these are my personal reasons for pre-boarding. The option to pre-board is available to those living with Type 1. The choice to do so is your own. To read more from the Department of Transportation you can click HERE. This option is available on all airlines because of the American Disabilities Act. I usually fly American Airlines, Delta or Southwest Airlines but it is similar across the board. With Southwest they want you to go to the counter first and say that you need to pre-board for medical. They will print you a new boarding pass that says “Pre-Board.” For all the other airlines, before boarding starts I go to the counter and say I need to pre-board for medical. They just inform me to go up to the boarding door when it is time. (No special boarding pass.) It is important to state beforehand because they may skip pre-boarding all together if they don’t know that there are people on the flight using the service. I hope my personal experience’s help you with your future travel. Please let me know if this information was helpful to you! Safe travels! This has been my favorite, so far. All your posts have been great but this one has to be one many of us will go back to time to time when traveling. Someone I was traveling with flagged one time as having explosives detected on his hands. They did a different test and found it wasn’t explosives after all. The TSA agent said the most common culprit is hand lotion. Apparently the petroleum in certain lotions are read by the chemical analyzer as residual explosive materials. Since then no lotion, no flags on travel day. I'm flying to Texas on Thursday and this came right on time. Thanks for the tips which I'll surely use! Keep sparkeling!!! Awesome  great info n tips!! Great post. Very informative. I was going to do a similar blog post, but for travelling with a T1d child, which my family did back in November. Keep up the great work. Old type 1 son. Only been a diabetic almost 2years. I feel better prepared. Have you considered TSA Pre? The cost is $80 for 5 years. This allows you to go through a faster line usually and you don’t have to take off shoes. I never knew about pre-boarding. I personally like waiting until the end to board. I totally agree with the pre-boarding. I used to never even consider it an option until a medical emergency I encountered on a flight this summer. I was traveling with my husband and we were in the middle section of the plane. During landing my blood sugar dropped to 34...I obviously wasn't feeling well and had gone thru all my sugar tabs earlier. After ringing the call bell and no response and not able to get the attendants attention my husband had to get up during the descent and get some juice for me. Obviously they were not happy with his decision to leave his seat, but they should have been upset that they weren't responding to a medical emergency. After that I read thru all the disability rights and realized that its better to be safe than sorry...especially because there are many times I fly alone or fly alone with my young children. Because of that I have been using the preboard and priority seating to be close to the flight attendant so that they would be able to help me quickly in case of a medical emergency. Thank you for posting your ideas as well. Just wanted to add a couple things to your terrific travel post. The TSA has volunteer officers that are specially trained as Passenger Support Specialists who work with passengers needing assistance getting through security. Every TSA supervisor is also supposed to be trained as a PSS. When you call TSA Cares the week of your flight, that information gets sent to the designated airports. Ideally you will be contacted by an assigned PSS before your arrival, however some airports just expect you to ask for a PSS when you reach security. In any case, whether you’ve called ahead or not, you can ALWAYS ask for a Passenger Support Specialist. I have found that many TSA officers are unaware of this program, so in that case you can ask for a supervisor. Be sure to ask the first TSA Officer you see at the beginning of the line. I use a PSS whenever I fly, and over 90% of the time I have a great experience. Frequently this assistance allows you to skip the line and go straight to screening with your PSS. (For me that’s a visual inspection and patdown, which can be done privately.) I still have a responsibility to arrive early, organize my supplies, and be informed about rights and responsibilities. It’s a service that is there to be utilized so I try to get the word out whenever I can. A little teamwork goes a long way towards making travel with Diabetes easier! Hi Carolyne! I use the frio when I need to be by the pool or something but when traveling I just use an ice pack in my insulated Myabetic bag. It will pass through security for medical purposes with additional screening. Thanks so much for taking the time to read!